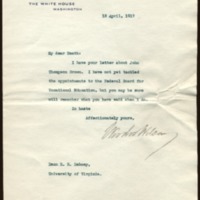 Woodrow Wilson writes to Richard Heath Dabney regarding possible appointment of John Thompson Brown to Federal Board for Vocational Education. I have your letter about John Thompson Brown. I have not yet tackled the appointments to the Federal Board for Vocational Education, but you may be sure will remember what you have said when I do. Wilson, Woodrow, 1856-1924, “Woodrow Wilson to Richard Heath Dabney,” 1917 April 13, WWP20522, University of Virginia Woodrow Wilson Letters, Woodrow Wilson Presidential Library & Museum, Staunton, Virginia.